I have been a 'collector' since I was a child, first items to catch my eye were Brooke Bond Tea picture tea cards, as a child I was fascinated by illustrations and pictures - I was hooked!, and I still am to this day. The quality of the artwork and the educational nature of the copy in these sets were immeasurable. Next came my first real passion - steam engines. My first engine being an SR1a - which I still own to this day. I was already interested in mecahnical toys such as Meccano and Lego - but this was another dimention and that was it, I was under the spell of Mamod steam engines. 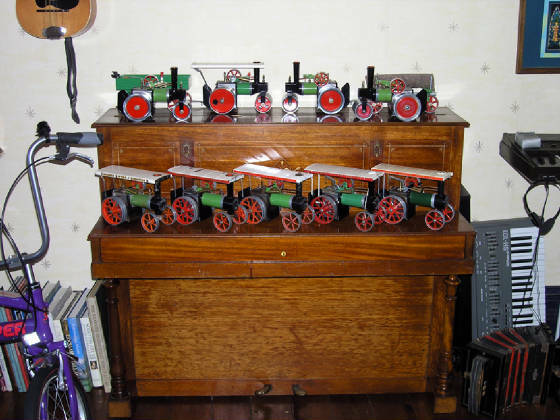 Today I can't get enough of them, although the focus of my collectiing has moved from collecting any engine to English steam toys from the 1920s to 1970. Bowman, Latimer as well as Mamod now grace my ever expanding collection. Cycling has always been a love of mine since I first balanced on a friends bike at the age of 8. The freedom and the ability to go anywhere has always appealed to me. To this day I still regularly ride, either to work or at weekends - it's healthy, its green and above all it's fun. Since getting my first bicycle - a Raleigh Rebel in 1972, I hankered after a proper racer! In 1976 I dad bought me a second hand Carlton Continental 5-speed racer - I have never ridden another marque since (albeit Birmingham and Worksop build Sun machines), the Carlton Cycle has become the centre of my cycle collecting. This wonderful firm, once based in Worksop is no more more, but a dedicated band of collectors and riders from the UK and from all over the world ensure that the name is kept alive - I count myself amongst the fortunate ones who owns a Carlton (in fact 11) and still regularly rides it. Corgi and Matchbox cars were the staple of every young lads toybox in the late 1960s and 1970s, me being no exception. The Corgi Rockets range particularly caught my eye as a lad, and I remember playing with them on my Grand Canyon Speed set in the early 1970s. Alas Rockets only lasted 2-years and Hotwheels won the day. To my mind they were the finest small scale diecast cars made, the novelty of the removeable chassis, the wonderful designs and the jewel like paint finishes were unbeatable - a feeling I still have to this day. To compliment my Rockets, I had Matchbox cars and Corgi Juniors too - both just as collelctable today. Finally (!) I still have a love of railways and model railways. After having a set when I was a child, I wanted to re-live those happy days watching my Hornby Tri-ang Princess Royal hauling it's smart set of Pullman coaches around. So a few year back I purchased a Flying Scotsman set and built it up from there. I mainly collect Western region/GWR locos and stock - although Im considering having a Bullied and an M7 running on my rails in the future! My layout, tentatively named "Clarendon Road" is an unashamed mix of GWR and Western Region stock, is a small preserved line somewhere in the Westcountry and maintains a busy schedule of passenger and freight workings. The layout still needs much work such as landscaping and weathering on some locos, but that will all be done in the fullness of time. At the moment I'm just enjoying 'Playing trains'!